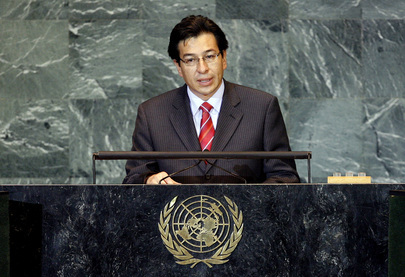 FANDER FALCONI, Minister for Foreign Affairs, Trade and Integration of Ecuador, said his country was committed to the revitalization and reform of the United Nations, as well as to the process of regional integration as a mechanism for coordination, cooperation and solidarity among people. Multilateral action was the best way to face today’s challenges. Each regional group involving Caribbean and Latin America nations aimed at creating a common agenda in the social, cultural, political and economic fields, so as to build a new model of development that was more inclusive and less predatory. Every effort towards integration required recognition of the principles of State equality and sovereignty, he said. Cuba was no longer excluded from the Organization of American States, but was still subject to the unfair embargo imposed by the United States. The coup d’état in Honduras had been squarely condemned. The international community must adopt strong measures to guarantee the restitution of democratic order in Honduras and to ensure the security of the Brazilian Embassy where the Honduran President had taken shelter since 21 September. Moving on, he said the systemic and multidimensional crises in the areas of food, energy and finance were symptoms of a system that did not work and had to be reinvented. The scandalous financial crisis, for example, did not call for technocratic reform, but for a change of economic model. Last Saturday, at an African-South American Summit in Venezuela, the Constitutive Agreement of the Bank of the South had been signed with a starting fund of $20 million. Other economic mechanisms initiated at the event had included the creation of a common reserve fund for Latin America, and a regional system of payments as a preamble to a Regional Central Bank. Consolidation of a common monetary system would commence with an electronic currency that would facilitate commercial exchange. Further on the financial crisis, he said the role of the international credit institutions remained questionable. The need to restructure external debt was urgent. The Assembly’s Working Group on the Financial Crisis was the ideal mechanism to implement the outcome of last June’s Conference. Turning next to the environment, he said climate change was evidence of imbalances in the relationship between society, nature and economy. The principle of shared responsibility demanded that rich nations go beyond donations or adjustment credits and make reparations that recognized their ecological debt and historic responsibility for excess emissions over several decades. His country’s environmental programme focused on ecological management of oil reserves, forest initiatives, and sustainable and renewable energy. Ecuador was also considering a possible “eco-tax”. Calling for support of United Nations initiatives in the areas of food security, achievement of the Millennium Development Goals, eradication of human trafficking and protection of migrants, he recalled that his country had been one of the Organization’s founding members. Ecuador was committed to regional stability, including by supporting the stabilization process in Haiti. Finally, his country had initiated a process that would lead to the normalization of diplomatic relations with Colombia. The dialogue and encounter of the annual Assembly session had made the progress possible.